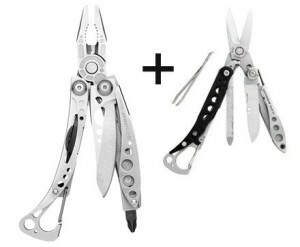 Leatherman Skeletool Mult-tool and Leatherman Style CS combonation gift set. The Skeletool multi tool is 7 tools in one and is the ideal tool for all outdoor pursuits, such as boating, camping, climbing, cycling etc, as well in the home or at work. The handy “Style CS” is a unique clip-on 6 piece multi tool that fits in your pocket or clips on your back-pack or bag for easy portability.Leatherman Skeletool Mult-tool and Leatherman Style CS combonation gift set.